Mainland Ecuador can often be quickly bypassed or rushed through in lieu of a Galapagos cruise. However, the mainland offers a diverse mix of sites and eco tours including the colonial capital of Quito, Mindo Cloud Forest, tropical rainforests, many national parks, and the colorful culture of Otavalo, among many other attractions. Below are a few popular destinations and Ecuador eco tours. Quito is the second-highest capital in the world. The city is spread across an Andean valley and has an abundance of unique colonial buildings. Much of the UNESCO World Heritage listed site of centro histórico, or old town, has been restored, though it still reflects the indigenous culture and history of the region. A walk through old town will take you past picturesque plazas and cathedrals, with snow covered peaks in the background. A 20 minute from Quito’s old town, you’ll find Quito’s new town, full of trendy cafes, international restaurants, unique bars, and boutique hotels. Step just outside the city and you’ll find primary Andean forest. Hacienda Rumiloma is an excellent addition to any Ecuador travel itinerary. The hotel gives travelers a view of Quito not many get to see. 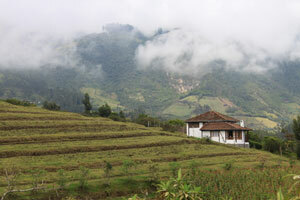 The hacienda is located on about one hundred acres of primary Andean forest next to the Volcano Pichincha. The land behind the lodge has several trails, a small river, many grazing llamas, and native birds. Just minutes away from the capitol, Hacienda Rumiloma is an incredible accommodation option in Quito. The Amazon rainforest in Ecuador has some of the world’s most diverse ecosystems and is home to thousands of indigenous people. Huaorani Ecolodge, situated in Ecuador’s rainforest, offers guests the chance to experience the Huarani culture and enjoy the incredible natural environment, while minimizing the negative impact on the surroundings. The lodge accommodates a maximum of ten people in five Huaorani-style thatched cabins. The cabins are constructed using local wood, have two twin beds, a private bathroom equipped with a shower and flushing toilet, and a porch. Situated in Terra Firma Rainforest, the eco lodge is an hour walk from the community of Quehueri’ono. 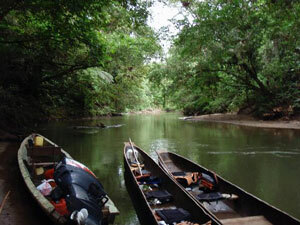 Visitors have the unique experience of seeing the rainforest through the eyes of the people who live there, learning about their culture, lifestyle, and their struggle to preserve the rainforest. This area and other parts of the Amazon are under the threat of being destroyed, but with community based eco-programs such as the Huaroni Ecolodge, we encourage visitors to help protect and preserve the region for future generations. Mindo is one of the most biologically diverse and endangered cloud forests in the world. Hundreds of bird species can be found in Mindo Cloud Forest. The town is about two hours from Quito, making it accessible for a day trip or for several nights stay. Other popular attractions in Mindo include tubing, orchids, butterfly gardens, cable cars, waterfalls, eco tours, and many different types of cloud forest. A great accomodation option in Mindo is El Monte Cloud Forest Lodge. Guests stay in private riverside cabanas and are surrounded by moss covered trees, crystal clear streams, beautiful orchids, and exotic birds. Mindo Cloud Forest is an ideal destination for nature lovers. El Monte helps protect the area by minimizing their impact brought on by tourism. The lodge has decided to stay small to keep a ratio between guests visiting and the amount of land owned. At El Monte all activities are led by local Mindo guides that have an abundance of knowledge about the area. Cotopaxi is the world’s highest continuously active volcano, and the second-highest peak in Ecuador at 19,347 ft. It is located in the center of Ecuador’s most visited national park, about one to two hours south of Quito and is included in most of our Ecuador tours. Popular activities at Cotopaxi include mountaineering, hiking, bird watching, horseback riding, camping and mountain biking. Located in a perfect position from which to explore Cotopaxi, Hacienda El Porvenir is a popular lodging option in the area. It is situated in the foothills of Rumiñahui, just less than two and a half miles from the north entrance of Cotopaxi National Park. The farm house is surrounded by four volcanoes, Cotopaxi being one of them. Hacienda El Porvenir was constructed using local building materials and in the typical style of Andean construction. Learn more about the local life feeding the horses, llamas, and sheep, making traditional bread, or join the locals in playing one of the most popular games in Ecuador, soccer. Otavalo is located about a two hour drive from Quito and is renowned for its unique market place. The local people enjoy sharing their native customs and indigenous culture, including the color, music, language, and dress that reflects the American-Indian essence. Otavalo is most well known for textile weaving, creating a variety of colorful products. The Otavalo market place has sweaters, tapestries, hats, ponchos, rugs, jewelry etc. During the week the town is fairly quiet, with mostly just locals. On Friday many tourists begin to show up. On Saturday Otavalo is bustling, with crammed streets, music playing and delicious street food being prepared. Mountainside Inn offers incredible views and a unique lodging option in Otavalo. The market is only a 10 minute drive from the hotel. Relax at the Mountainside Inn on a hammock, in the hot tub or by the fire listening to local music. The lodge has eight cottages, each with a garden and private terrace that has spectacular mountain views. To start planning your Ecuador eco tour, please fill out a custom tours form or call us at (866) 577-2462!